How are these Fishes powered? do they use solar cells or pressure cells or normal battery? 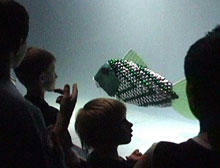 The robotic fish will be a boon for ocean researchers. I mean a small hack can actually transform it into a video transmitting device. Not too sure, I guess they might be using batteries for short exhibitions. Long term use might use solar/pressure power.